Airsoft vs Paintball:Which is more Fun? The Debate Ends Here! Are you sick and tired being roped into yet another debate about which sport is better? I have a secret for you. The answer is both and neither. 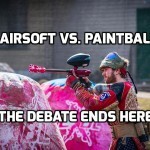 The airsoft vs paintball debate is like having to choose who you like better, mom or dad. Mom and dad are both great (or not), so why is everyone so insistent that you choose? I am herby granting you permission to choose neither. To some, they are both great sports, some like one or the other and possibly there are folks out there who like neither. Whatever. The world will keep spinning, right? What we want to talk about here is what is the difference between paintball vs airsoft? So….with that out of the way, let’s get this show on the road, shall we? Well, What Makes YOU so Special??? Which sport is more FUN for beginners? OK, OK, maybe you are not a history buff, but these are great sports we are talking about, so this will be interesting. Very basically, airsoft is a combat sport where opposing teams carry airsoft guns that shoot small plastic BBs. That depends on the objective of the game. 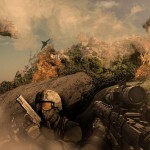 One game may be a death match, where the goal is to shoot EVERY player on the opposing team, before all yours are shot. Some games are ‘capture the flag style, where a team must capture the flag, or some other assigned object, that the opposing team is protecting. Some games are won by an individual based on how many ‘kills’ the player made etc. The goals can be endless, quite creative and can simulate real battle situations. What is the history of airsoft? Airsoft began as a sport in the late 70’s to early 80s with the Daisy Company and Tokyo Marui making some of the first model of airsoft guns. Paintball is the airsoft predecessor, but since paintball is not legal in Japan, airsoft really took off there, and several large manufacturers got their start in Japan. The game spread through Asia and came to the UK, Canada and the US in the 90s. Paintball is a game played with two opposing teams who are equipped with paintball markers. The markers shoot paint or dye filled capsules designed to leave a stain or mark on the opponent. It is like a cross between dodge ball (paintballs are huge compared to BB’s) and tag (Splat, Gotcha! ), only using a gun. The objectives are similar to airsoft and can vary, just like airsoft games. The first paintball gun was actually designed in the 60s to allow forest workers to mark timber for removal. The gun was called a Marker, because it was used to mark wood and other objects. The first guns were squirt guns. Imagine the mess playing with paint filled squirt guns! Hard, paint filled capsules we call Paintballs were developed later, in order to go farther and use less paint. The very first time paintball guns were used in a game (that we know of) was in 1981. So, technically paintball guns have been around longer, but airsoft and paintball, as the games we know today, became popular about the same time. The most unique aspect if airsoft, the ‘thing’ that sets this game apart, is in a word, realism. The guns are designed to look like and feel like real guns, replicas of weapons used in war and by law enforcement. 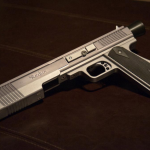 This makes airsoft guns ideal training weapons. In addition to the realistic guns, the game itself tends to lean towards real life scenarios. BB’s are heavier, and therefore naturally more accurate than paintballs. 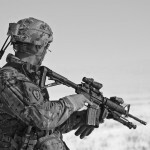 For this reason and many others, airsoft is used for military and law enforcement training. 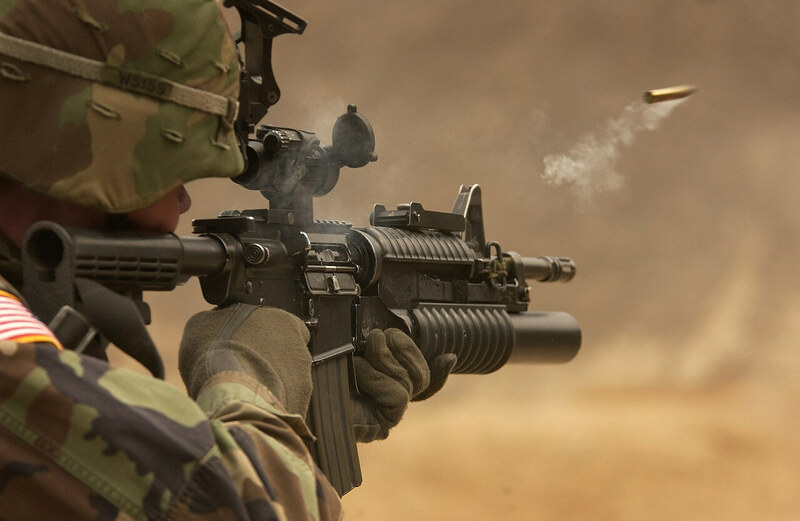 In the late 00s the US military began using airsoft guns in training. 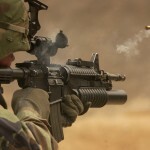 Airsoft guns allow soldiers and law enforcement to engage in simulations similar to what they will encounter in the field. This realistic training allows combatants to experience the consequences of mistakes and hone their skills, potentially saving lives. Adrenaline, chaos, fast-paced, speedball, lively, and SPLAT are words used to describe paintball. These words are what make paintball different from airsoft. Paintball is for those who have an affinity for velocity. It’s a rainy day and the field is one giant mud pie, but you don’t care because only the diehards play in these conditions. You are bunkered behind a temple shooting furiously at the opposition. You see an opening and you decide in that moment to take an opportunity to advance. You run out from the cover of the temple and full on slide behind a snake, covering your pants and jersey in mud. It was worth the risk because you advanced on the enemy and did not get hit, despite al the balls you saw flying in your direction. One ball hit your hopper and bounced off, and just barley skimmed your leg without breaking, but you made it. Your heart is racing as you hear the storm of paintballs assaulting the snake now covering you. 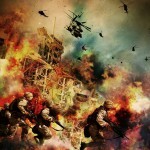 The battle is intense, and the intensity is what many paintball enthusiasts love about paintball. As we mentioned, airsoft guns are replicas of real guns that shoot plastic BBs instead of real ammunition. Another huge difference between paintball vs airsoft are the guns and variety available. In this respect there is simply no contest, airsoft has far more variety and types of guns available. In addition to that, airsoft guns are categorized by position. 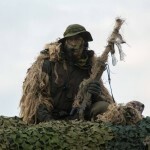 Airsoft positions include sniper, marksman, support gunner, scout, grenadier, saw gunner, medic and a range of other positions. Shotguns, assault rifles, sub machine guns, heavy machine guns, sniper rifles, handguns, pistols, and the list just goes on. There are three ways to power airsoft guns, electric, spring and gas powered. These guns use a battery to power the gearbox and have the ability to fire BB’s in succession. Gas powered guns are more expensive than the others but allow you to shoot many BB’s at once and offer recoil for a very realistic feel while shooting. Spring powered guns use neither battery nor gas, are inexpensive and usually quiet. Some sniper rifles are spring powered. They have to be cocked for every shot, so they are not ideal if you need to fire off a few rounds in succession. Electric guns are the most popular type of airsoft rifle for all except snipers, who prefer spring loaded guns. Since an electric gun uses a battery pack, the battery can be contained inside the gun, and will not get in the way like a gas canister on a paintball marker. If you are trying to choose between airsoft or paintball, consider the bulk factor. Paintball markers are bulkier because they frequently have gas tanks and large hoppers full of paintballs. Airsoft BBs come in different weights, ranging from the cheap, casual play .12 gram weight to the sniper weight of .36 grams or even .40 grams and above. The BBs weight depends on the FPS of your airsoft gun, the position you play, field limitations and other factors. The standard BB diameter is 5.95mm for airsoft vs paintballs which are about 17.27 mm in diameter. That’s a pretty big difference in size. BBs are also hard, and ideally perfectly spherical, making them fly straighter, longer and more accurately that paintballs. 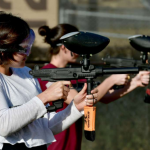 Paintball markers can also be spring, gas and electric guns. The biggest difference between airsoft guns vs paintball guns is that instead of using fully electric guns, paintball markers most commonly use gas combined with an internal battery. The most common gases used are C02 and compressed air. For this reason, most paintball markers will have a gas cartridge attached, which detracts from realism, and can be awkward. It is hard to have a gun that looks real when there is a gas can attached to it. Those who love paintball usually do not care about having a realistic look, but for those who want a realistic look, airsoft is more popular. 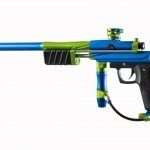 The most common paintball markers will also have hoppers, which hold hundreds of paintballs. The hoppers sit on top of the gun, and when they are full, change the balance of the gun quite a bit. 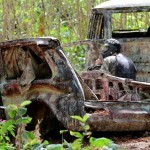 This hopper is another reason paintball markers are not ideal candidates for replica guns. The vast majority of paintballs are .68 caliber gelatin capsules filled with a paint of dye. Paintballs have grades or quality levels. 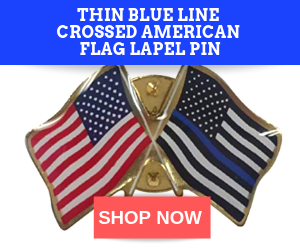 They come in field or recreational grade, or a tournament/pro grade paintball. There is even a winter grade that exists for cold weather. Some high end guns require high quality paint, but weight is not a factor like it is with airsoft. Paintballs are 3 or 4 times as expensive per round, and add to the cost of playing paintball. Generally speaking, most folks agree airsoft is less expensive. The biggest factor causing paintball to be more expensive is the cost of ammo and the amount used. 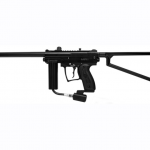 Many paintball guns use a hopper and are rotor fed, which means they can blast out paintball after paintball spraying the opposing team with a shower of paintballs. 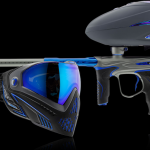 The pop, pop, pop of the paintball marker is like the Cha-ching of a cash register, so if you love paintball, be prepared for this cost. Some people say paintball is more expensive because of the gear and guns, and this is true to some extent. On average paintball markers are more expensive than airsoft guns. 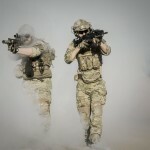 As for gear, it can be as cheap or expensive as you decide, and there does not seem to be a huge difference in gear price between airsoft or paintball. However the gear for airsoft is different from paintball, leading to the next point. 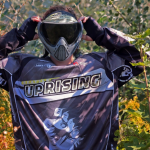 Goggles are the minimum requirement for paintball, but most players wear full face protection, and for good reason. A BB to the face hurts! BBs have, on occasion, knocked out teeth, so full face protection is essential. Note that mesh eye protection is NOT recommended for airsoft because plastic BBs can shatter and cause eye damage. BBD or Barrel Bag to prevent unintentional firing of the gun. 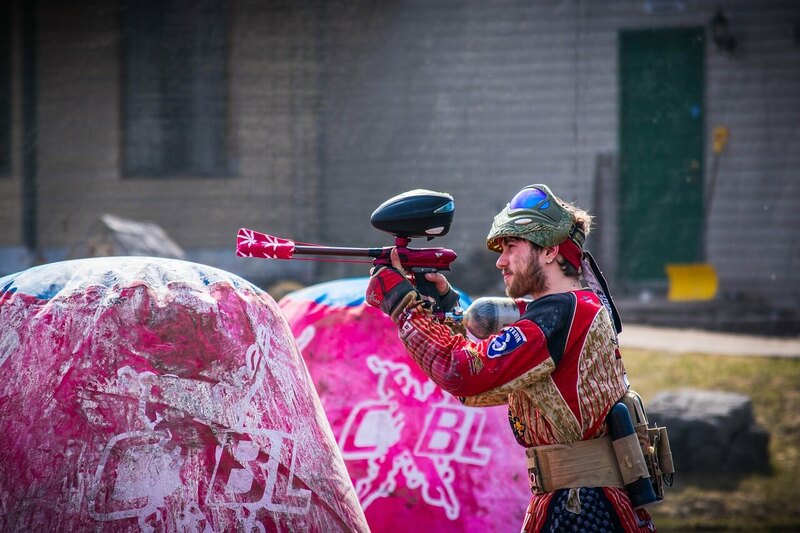 Pro paintball outerwear can be a lot more colorful than airsoft gear, especially when it comes to speedball. Paintball is known for bright colors, and that goes farther that the paint itself. There are colored guns, jerseys, paintball pants, tactical gloves ect. There are paintball players who use camouflage too, especially for woodsball, but camouflage is the essential attire for the airsoft player, due to the realistic nature of airsoft. One only needs to Google ‘airsoft jersey’ and ‘paintball jersey’ to see the difference. An Airsoft jersey search will result in a slew of camo shirts, and a search for paintball jersey nets you a gang of colorful jerseys. It totally depends on the interests of the individual and what they consider fun. Paintball is generally more physical, like a game of tag, with running and lots of movement and quick action all around. 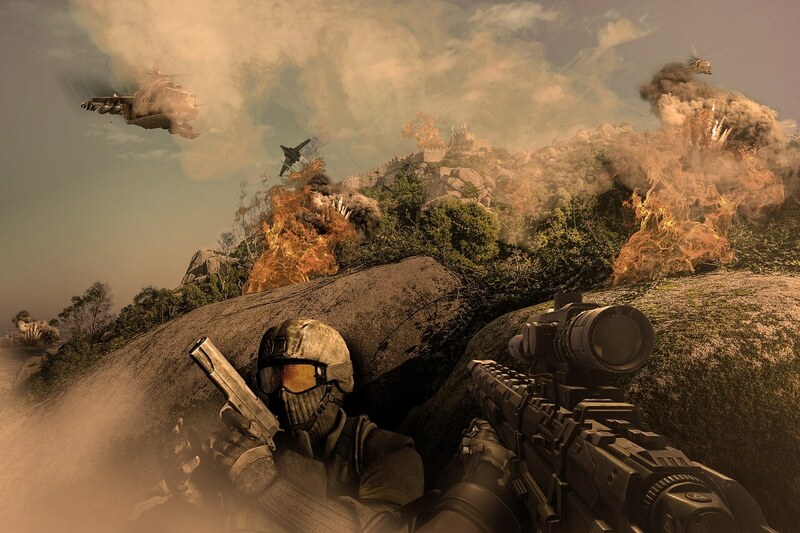 Airsoft is more mental, tactical, and methodical, and relies on skill, stealth and marksmanship. Make no mistake, there is skill involved in paintball, and airsoft has its physical side, it’s just that each game has a balance tipping in favor of one or the other. Many players play both sports and enjoy both, for the features each game offers.